From your iPhone, iPad incoming call respond with text automatically when you don’t want accept call or due to some circumstances or when you are in Meeting or Driving time. 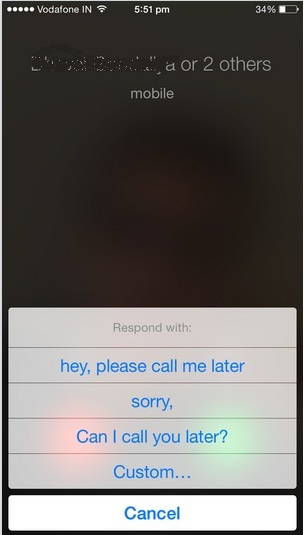 Apple gave truly incredible option for send text response automatically directly from your caller’s screen. Make ready text message template for send quickly to your caller by simple one tap. If you don’t want turning on do not disturb, so this is middle solution for your problem like, Don’t talk by send notification about you without receive call and talk with them. Useful: How to turn on or turn off Predictive text on iOS 9. Step 1: Go to the setting app from iPhone. Step 2: Next, under the setting tap on Phone. 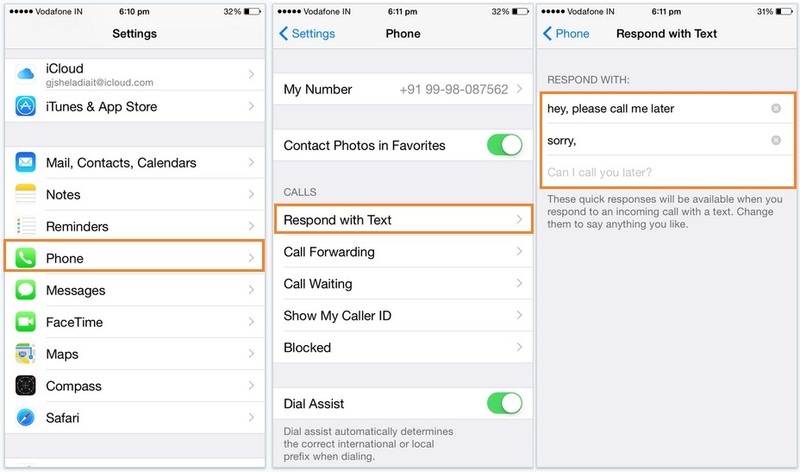 Step 3: Now, Under the calls section go with respond with Text. Step 4: Here, you can create three different sample templates, that’s all available at the time of response on incoming call screen. Keep ready three texts, no any limitations in text length. in more user’s satisfaction apple also gave option for send custom message that’s depends on situations we can sent in text. Popular text much useful for all situations: Sorry I can’t receive call right now, I am on the way, I will call back you later; give more time I will check and call back to you soon. See the below screen, when you will receiver call, Just tap on Message over the call accept button. Then, you will see different options as text templates. Press on it, your caller receive iMessage or Text message instantly on iPhone. To say some other text, tap on custom and send it. Note: if, iMessage is activated in your iOS device, than you will bo no charge by carrier otherwise it will charge depend on carrier. Very useful hidden features, Must use when you want send instant text message, contacts number as incoming call respond with text message.